The Ride & Revel! cycling event began in historic downtown Greeley, Colorado, home to nationally recognized, award-winning craft breweries. At the finish, many enjoyed a prepared meal and a beer crafted just for our annual Ride & Revel! event by Greeley’s award-winning brewers. ENJOY! The signature beer for 2017 was a Lemon-Wheel IPA! Cyclists on the 20, 40, and 55 mile route will enjoy the gently rolling farm and ranch-lands of north Greeley. Pedaling west, you’ll find the panoramic views stunning, with the mountains as an ever present focal point. The 40 and 55 mile routes turn south paralleling the Rockies with views to the horizon in all four directions. From the ridge at the turnaroud, the horizon is clear in all four directions at once, and you’ll swear you can reach out and touch the Rockies! Loop around in the quiet challenge of the countryside hills and catch your breath as you coast down off of the ridge before one final push up the famous Mad Russian Hill. Soon after you’ll rejoin the route head and back toward downtown Greeley. There are a few additions to the routes for 2019. Also there are discounts for Students, Seniors and Veterans! 40 mile route - New! We’ve added two Gravel Rides this year. Yes! Biking on unpaved roads has exploded in popularity! Gravel riding is one of the fastest-growing styles of cycling, and for good reason: it takes riders off-road, but not too far. Less traffic, more scenery, a change from the norm and it’s SUPER FUN! And Weld County is chock full of them… If you’re looking for some inspiration—or maybe your next bucket-list adventure, try our Gravel Rides. Learn for yourself why it’s affecting the whole cycling industry! FREE PARKING for riders/volunteers directly north of the DoubleTree Hotel. Ride Start/Finish/Revel! area will be on 7th St between the DoubleTree Hotel and Lincoln Park. 10:45 AM – Revel! event begins. Please plan accordingly so that you don’t miss the fun! Noon – Blues DoGS take the stage! *all cyclists must wear helmets AND sign a waiver on event day. OTHER IMPORTANT EVENT DETAILS – The weather is supposed to be HOT, so drink plenty of fluids before and along the ride! *All cyclists must sign a liability waiver on event day. *All cyclists must wear helmets. *Appropriate related ID must be presented at check-in by students, veterans, and seniors (65+) receiving discounted pricing. *Please arrive at the cyclist check-in canopies at least 30 minutes before your ride begins. *Routes are supported between 7:30 AM and 12:30 PM, including volunteers, police officers, aid stations, a sag wagon, sweepers, and mechanical crews. *Volunteers and aid stations have emergency contact information and cell phones, and you will be given a business card at check-in with a number to call if you need assistance while on the route. *Cell service is available on close to 100% of all routes, and outage areas are short. *Aid Stations will have cell phones, restrooms, food, water, maps, and pre-mixed Skratch Labs Hydration at the following approximate mile markers. *Greeley’s elevation is 4,658 feet, so the air may be thinner than you’re accustomed to. Please plan and prepare accordingly. *The average high temperature in Greeley in July is 88 degrees, with an average low temperature of 59. Please plan and prepare accordingly, including training, nutrition, clothing, hydration, etc. *Please carry at least two filled water/hydration bottles with you on the ride as well as personal identification, a cell phone, sunscreen, lip balm, sunglasses and/or a hat, hydration powder, high energy food, tire change/patch kits, and any medications deemed important by you or your doctor. *A medical doctor will be volunteering on the day of the event. *A Bag & Bike Corral will be available from 6:30 AM until 2 PM inside the DoubleTree. 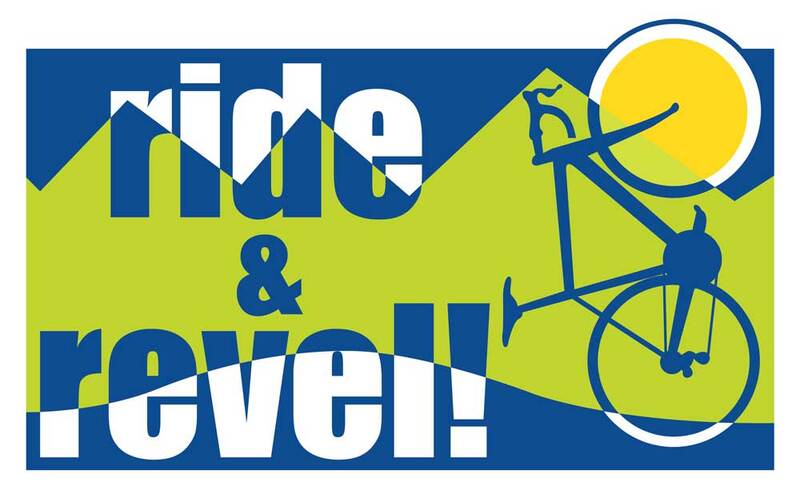 Check your swag bag for the duration of the ride, then add your bike when you return so that you can fully enjoy the Revel! portion of the event! *Route maps are available in hard copy at check-in as well as electronically at RideandRevel.com under the About the Routes tab via ridewithgps.com and the gravel routes via strava.com. *We are excited about our swag bag because we think you’ll love it! A Ride & Revel! cooling towel is the most popular item, but riders also appreciated the sunscreen, energy bar, trail mix, brewery discount coin, breakfast gift card, downtown business coupons, and Visit Greeley information. And you never know what might be in the bag this year! *The Revel! after-event will feature a to-order foodtruck brunch menu, Lemon Wheel IPA craft beer locally brewed for Ride & Revel!, and a live blues band! Also available are ice cold water, non-alcoholic beverages, frozen yogurt, dollar-a-minute power massages, and delicious coffee/tea. *DIA is just an hour to hour and fifteen minute drive from Greeley, so is extremely convenient for those of you coming in from out of state and renting cars! For a small price you can make the trip even smoother by using tollway E-470. Shuttle services are available through greeleyshuttle.com, as well. *Please see wonderful downtown Bed & Breakfast and hotel lodging options at RideandRevel.com under the Revel! tab. Quaint and quiet Currier Inn B&B is run by cyclists, will donate $10 to Ride & Revel! for every booking, and is a short six blocks from the event site. The Double Tree Greeley at Lincoln Park’s General Manager is also an avid cyclist, is on the R&R! planning committee, and is offering a block of discounted rooms with the Start/Revel! area just outside the doors! *Still have questions after seeing the event schedule? Please check out the rest of the website or email us at RideandRevel@SRSweld.com and we’ll get back to you!